Canada’s P. J. Perry has long been a monster alto player in the mode of Phil Woods. He and Woods possess similar tones and generally agree as to how to deal with the legacy of Charlie Parker. 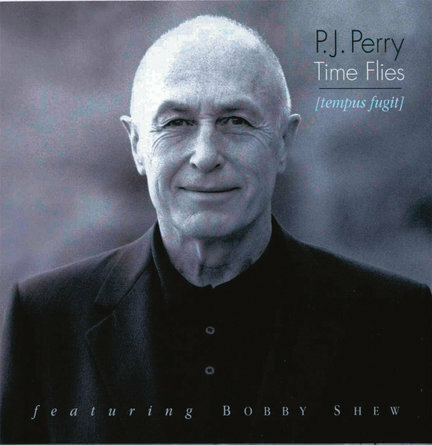 But Time Flies, recorded live in 2003 and 2004, is evidence that Perry is among the best altoists on the scene today. A glance at the program sets up the stylistic expectations, as it includes Bud Powell’s “Tempus Fugit,” Horace Silver’s “St. Vitus’ Dance” and Gigi Gryce’s “Social Call.” Sure enough, Perry and colleagues, among them trumpeter/flugelhornist Bobby Shew, remain true to the bop/hard-bop origins of the tunes. Beyond that, however, Perry offers a gorgeous reading of Ellington’s “Warm Valley,” on which in sound and manner he pays fitting tribute to the great Johnny Hodges’ performance. Likewise, on the slow “Tenderly” he is poignantly respectful of the classic melody. A top-form Shew maintains the high standard, including an impressive negotiation of the changes of his own barnburner “Counting Down.” Although pianist Ross Taggart plays fine piano on both dates, bassist Neil Swainson and drummer Joe LaBarbera trades off with Andre LaChance and Dave Robbins with no change in quality.